all previous cases — instantly. Summaries of each holding in every published case. Summaries online the day cases are published. Years of holdings on a single topic available with a keystroke. All summaries written by an experienced appellate lawyer. 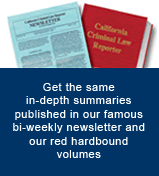 All California and select U.S. Supreme Court decisions. NEW! Summaries now linked to the full text of the case. NEW! Sort for defense-favorable cases within each category. One year subscription — just $225!